Whether you’re turning 5 or 50, you’re never too old for funfetti! 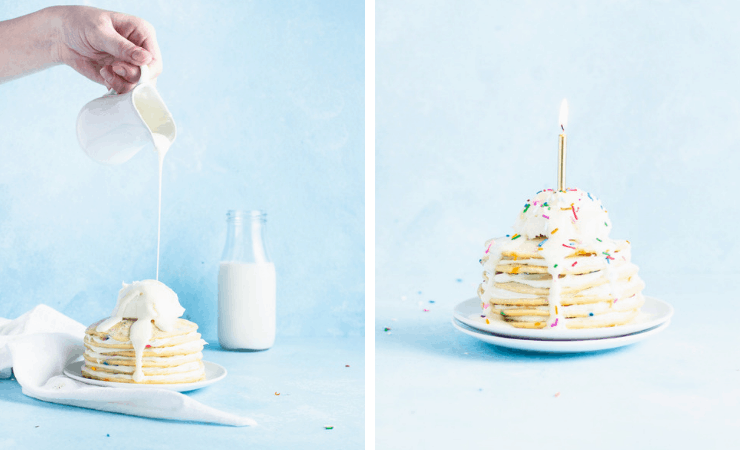 These birthday cake pancakes combine that sweet funfetti flavor with a decadent vanilla frosting and all the sprinkles. You’re just 15 minutes away from birthday cake for breakfast deliciousness! Last week was my birthday and every year, for as long as I can remember, I’ve requested funfetti cake or cupcakes with vanilla frosting and copious amounts of sprinkles for the occasional. But as we age, we start asking the tough questions in life. You know, the real hard hitters. 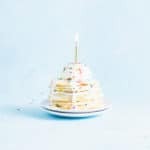 So this year I decided to throw all caution and adulty-ness to the wind and celebrate exactly how 5 year old me would want: With a giant stack of funfetti pancakes smothered in frosting and sprinkles. First, whisk the melted butter until smooth. Add the egg and continuing whisk until completely incorporated. Repeat with the milk. Add the flour, baking powder and vanilla and almond extracts, whisking until the batter is lump-free. Second, add the sprinkles, give the batter a gentle stir or two, and pour onto a hot, non-stick, lightly greased griddle or frying pan. 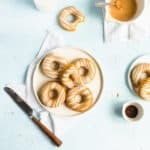 Many sprinkles tend to loose their color the longer their emerged in a liquid, so make sure you’re not adding them to the batter before you absolutely have to. Third, cook the pancakes until golden brown on each side. Remove to a cooling rack and let cool until no longer hot to the touch. Finally, spread a thin layer of vanilla across the top of each pancake and stack to the desired height. 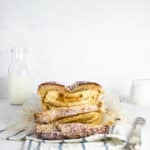 Melt a few tablespoons of leftover frosting and gently drizzle it over the top. You can also use maple syrup if you’d prefer. Top with a spoonful of frosting and sprinkles. Dry, uncoated sprinkles like jimmies and quins tend to lose their color the longer their submerged in batter. 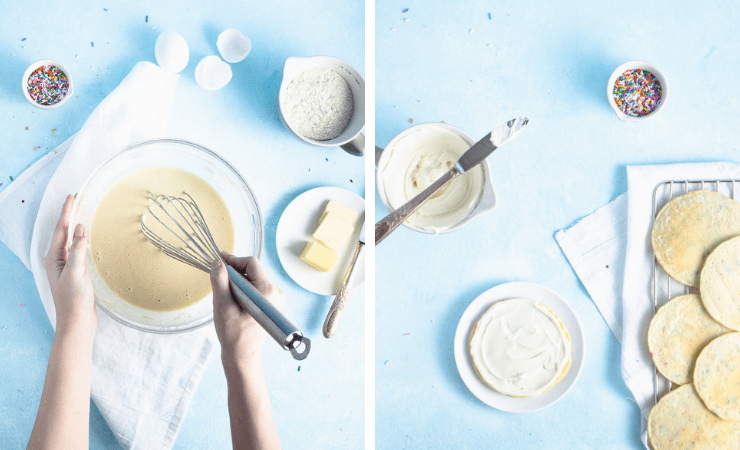 To keep the colors from running, don’t add your sprinkles to the batter until the last possible moment. Alternatively, you can add your sprinkles directly to the uncooked side of the pancakes. Once flipped, the colors will bleed up to the top of the cooking pancakes, but may look like a bit of a hot mess on the bottom. To get that perfectly round scoop of frosting on the top, I use an ice cream scoop. To keep a soft frosting from losing it’s shape as it’s pushed out of the scoop, try freezing the ice cream scoop for 5 minutes. 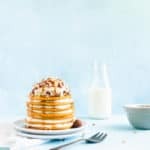 Storing pancakes: Looking to save time? You can make these pancakes ahead of time and refrigerate them for 1-2 days or freeze them for 1-2 months. Simply place a piece of parchment between each pancake and seal in an airtight plastic bag. 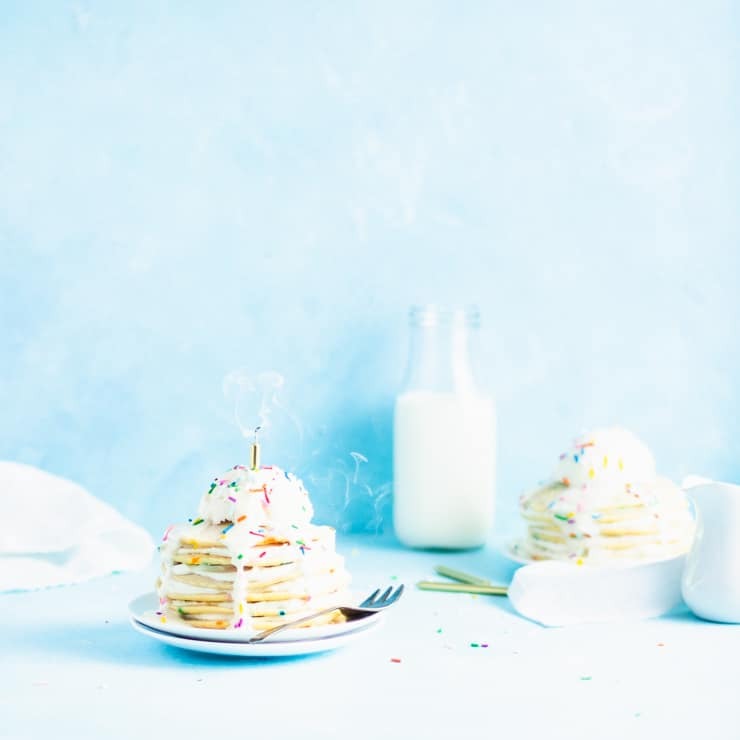 Reheating refrigerated or frozen pancakes: Simply microwave your pancakes on medium power for 1-2 minutes or bake at 350F for 10 minutes. 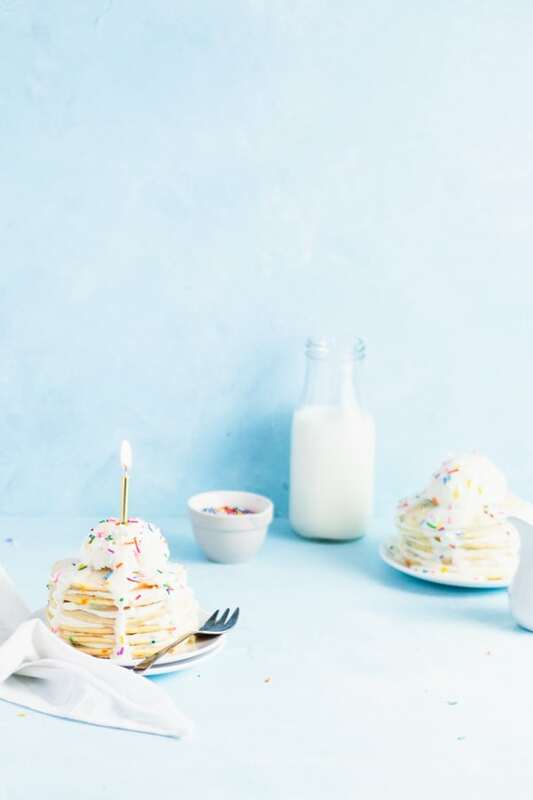 These birthday cake pancakes combine that sweet funfetti flavor with a decadent vanilla frosting and all the sprinkles. You’re just 15 minutes away from birthday cake for breakfast deliciousness! In a bowl, whisk together the melted butter and eggs. Add the milk and whisk until just combined. Add the flour, baking powder and vanilla and almond extracts, whisking until the batter is lump-free. Quickly stir in the sprinkles and pour the batter onto a hot non-stick pan or griddle, cooking until golden brown on each side. Once the pancakes have cooled slightly, frost each with a thin layer of vanilla frosting. Stack to desired height. Melt a few tablespoons of leftover frosting in the microwave (about 10-15 seconds) and pour over top of your pancakes. You can also use maple syrup if you would prefer. These are sooo pretty! So perfect for birthdays! You are definitely never too old for funfetti 🙂 I will be requesting a big ol’ stack of these my next birthday! Those look beautiful, colorful and delicious!! I love funfetti and would love to have birthday cake pancakes this year. What a fun and yummy idea! Who doesn’t love sprinkles? This is a treat for sure. Happy birthday!! I love that you made yourself some funfetti pancakes!! This post was a great reminder that it’s still fun as an adult to have fun and celebrate the pretty and sparkly things in life!! I will definately be making this! What a fun way to start of a birthday day. Anyone would feel special being served these. I can’t even with these pancakes. My birthday is in a couple of weeks, and I honestly may request these for brunch! lol. 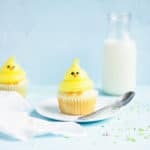 The sprinkles make it so fun and inviting; I like your tip of waiting until the last minute to add the sprinkles so they don’t lose their color! These are the cutest pancakes ever! And they’re so delicious. I plan on making these even without a birthday to celebrate. Thanks for sharing! This looks like a great fun way to start a birthday. I think my little one will relish this. 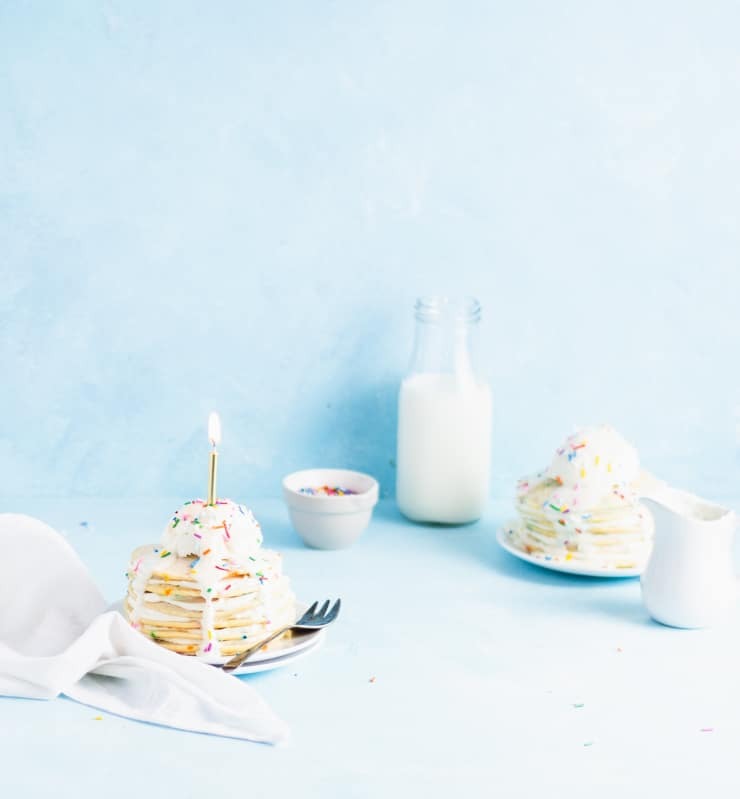 This pancake cake is such a great party idea. I’m throwing one next week and I’ll be definitely making this delicious cake. I bet my guests will be surprised and delighted. It looks fantastic!